Boxer skull. Canis Familiaris. 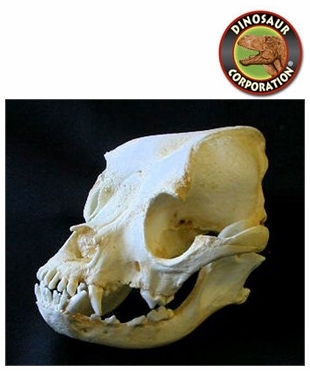 Boxer skull replica is cast from original specimen. The Boxer is a breed of medium-sized, short-haired dogs developed in Germany. Their coat is smooth and tight-fitting; colors are fawn or brindled, with or without white markings, which may cover the entire body, and white. Boxers are brachycephalic (they have broad, short skulls), have a square muzzle, mandibular prognathism (an underbite), very strong jaws, and a powerful bite ideal for hanging on to large prey. The Boxer was bred from the Old English Bulldog and the now extinct Bullenbeisser, and is part of the Molosser group.